I would say this, perhaps in the same location, with this contraption called my nose way up in the air. However, all of that changed when a special birthday party took me to Calabar sometime in 1999. I marveled as I moved around the clean and serene city of Calabar...quaint, unspoiled by the corruptible winds that seemed to pervade the rest of the nation. Over time, I got to learn a lot about the land of Calabar, also known as the Canaan city. I got to learn more about her convivial people, piled on several pounds from overindulging in her extraordinary cuisine and perhaps, most importantly, discovered her amazing yet dilapidated tourist sites. Calabar, the first capital of Nigeria, seemed to have a unique take on the history of West Africa. I had heard stories of how royals sold their kinsmen to European capitalists for copper rods, gun powder, whiskey, gin, tobacco etc; how some of the human ‘cargo’ were thrown into the sea because they had ‘depreciated’. 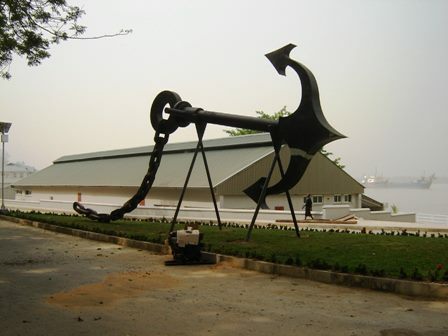 The first thing that greets you on arrival at the Slave Museum at the Marina Resort is a large replica of a slave ship. About 12 feet high, sailing to the land of no return, the human cargo almost woven into one another; each one’s face directly touching the feet of their ‘neighbor’; a warped device to prevent them from planning a revolt. I went with my friend, Edith and her 5-year-old daughter, Molly. Molly’s quest for adventure ended right there; couldn’t say I blamed her, though. That scene was as horrific as it was didactic. I also recall seeing a photograph of the Esuk Mba slave market in the Akpabuyo local government area of what we now know as Cross River State, where slaves were brought from the Bight of Biafra and Southern Cameroon to be exported to Europe and the Americas. I hear the barter system still operates there. As I walked around the museum, I saw what looked like slaves sitting in a barracoon. After contemplating a while, I concluded it wasn’t real but in a moment, I began to hear voices. They were crying! It was so vivid I could almost hear my own heartbeat. ‘Am I going to be cast in?’ I wondered. That experience took me as far back as the 16th Century when my ancestors were plunged into a life of intense, unparalleled agony. I think it was then I remembered Pastor Cheryl Hill’s words, “I am here on reconciliation exercise,” she said. This was during her very first visit to Calabar sometime last year. Hill…I describe as someone you could easily walk past until she starts to speak. When she does, you are totally enthralled by her depth, her passion, and her demeanor. Never mind her small frame and unassuming look; Cheryl Hill is loaded; a diamond encased in several beautiful boxes. Hill talks about her “African expedition” with ease...in a bubbly tone that makes one wonder how she manages the intense offices she represents, having spent a total of 35 years between ministry and the American Government. She is the liaison to the White House on faith based issues. "To think that Africa was not anywhere on my radar," said a visibly joyful Hill. She had set ideas as to where to go but God had other plans according to her. “He pointed to Africa and I said no!” Then came one crucial question, 'Would you rather go where you want or where you are needed?'" So, in total obedience to this divine command, Africa, the last continent on her priority list escalated to the top. Her first trip to Nigeria or assignment as it were, was to Calabar, the nation’s first capital. Before her visit to Nigeria, she had been to the neighboring country, Benin. Guy Djoken accompanied Hill on a fairly recent visit. A Cameroonian by birth, he is executive director of the UNESCO Center for Peace, current president of the Frederick County branch of the National Association for the Advancement of Colored People (NAACP) as well as vice president of the state of Maryland's NAACP. Djoken also shares Hill’s passion for reconciliation; upgrading the Slave Museum at the Marina Resort being a recent passion he embraced upon his first visit to Calabar. Later, Djoken became an activist at his college and joined a movement to bring greater democratic reforms to his homeland and to all of Africa. Many of his friends and fellow activists were jailed; some were killed while others disappeared. Djoken himself left the country after he was warned by government authorities in Cameroon to tamp down his activism. He later received a visa to travel to the United States from Ivory Coast. At the time, being a human rights activist in the U. S. seemed like paradise compared with Africa, he said. In many ways, according to Djoken, these rights have been afforded to minority populations in the country through the acts of countless individuals and landmark legislation. Still, disproportionate unemployment, incarceration and gaps in education among minorities remain the ongoing focus of his efforts at organizations such as the NAACP. Like Hill, Djoken had other plans and Nigeria was not on his agenda. He was contacted a few weeks before this significant trip and decided to change his schedule to come to Calabar. It’s interesting how the land of Calabar, Nigeria, Africa as it were, is hardly on the agenda but becomes a passion once visited. Indeed, I stand guilty as charged. Calabar was a no go area for me but has since become my passion. I did mention another city located far at the opposite end of the country... Sokoto. Enuma Chigbo is from Umuoji, Anambra, Nigeria. She earned a Certificate in Media Enterprise at the Pan African University of Lagos and currently lives in Calabar.